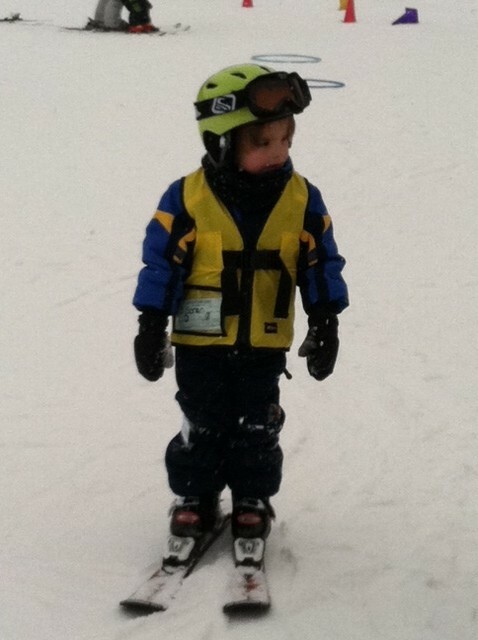 We enrolled our three year old, Soren, in his first ski lesson last year. We’ve actually had our son on the slopes since he was 19 months old, however this was his first true lesson, taught by a teaching professional and made official by a liability release form and credit card receipt. As with every other aspect of parenting, the day was part learning experience and part sit-com. Fortunately, when all was said and done, we managed to keep our spirits light and our son wants to do it again. Our first lesson experience started with the usual bi-polarness, well before we got to the slopes, as my son’s eagerness to go skiing teetered back and forth between “yes” and “no.” After muted attempts at reasoning, multiple counting-to-threes and finally subtle threats (each countered by an entire deployment of delay tactics) we were able to get Soren into the car. It didn’t take long for his usual enthusiasm to take over, and my husband and I to look at each other, smiling, in anticipation of a memorable day of family fun on the slopes. It was a car commercial in the making. We arrived at the ski area (Crystal Mountain in Michigan) and reveled in landing what was one of the most perfect parking spots. Near the learning area. Near the lifts. Near the bathrooms. The day just kept getting better and better. Five minutes later, however, we were giving up the golden parking spot, and I was on my way back home to fetch said three-year-old’s ski coat from our home, half an hour away. Luckily, Crystal Mountain was more than accommodating. They allowed us to move his lesson to the afternoon session – and if that didn’t work out, also told us we could re-book for another day and time. With Soren soon properly clothed, ski jacket and all, we slipped him into his afternoon group lesson for what we hope is the start of a beautiful friendship – Soren and skiing. My husband and I bundled our one-year-old son up and watched from afar, thankful that it was someone else’s quads other than ours this time. There’s a reason why ski areas see a dip in visits from once-avid skiers who now have young children in tow. And if you’ve found your way into this category, I don’t need to tell you what that is. But what I can share with you are some Dos and Don’ts for introducing your young ones to skiing. Because someday, your kids will be sitting next to you on the chairlift, conversing with you like they haven’t done in awhile, and you’ll be thinking to yourself, “I am so glad we did this.” This is family time. Winter style. (1) Do keep it fun. Whether enrolling in a lesson or braving it yourself, FUN should always be the number one goal. We didn’t even attempt teaching technique the first two years on the slopes with Soren. Could he turn? No. Stop? Not even. But he was squealing with delight as he skied in between our legs. (2) Don’t go it alone. When it IS time to introduce technique, leave it to the pros. Just because you can ski, it doesn’t mean you can teach. Especially to kids. Besides, your quads will thank you. Your back will thank you. And you’ll get a little ski time in, sans kids, for once. Remember what blue and black slopes are? (3) Do allow plenty of time. Get to the slopes early, especially if you have to rent equipment. Lines during the holidays and on weekends are imminent. So are multiple trips to the potty. (5) Don’t be a Hovermom. Or dad. It’s OK to watch your child’s lesson, but do so from afar, preferably a hidden vantage point. (6) Do cut some slack. Group lessons are just that. (If you expect a lot of one-on-one instruction for your child, enroll them in a private lesson.) Know that a group of young children on skis can be likened to a litter of kittens. Just as one is corralled back into the box, another escapes. The instructors will do their best to work with each child as much as possible. But it ain’t easy. (7) Do ask. At the end of the lesson, ask your child’s instructor what verbiage they use to explain techniques to your child. To teach Soren how to get his arms out front (and hence, keep his weight off the back of his skis), his instructor today told him to “Fly like Superman.” Brilliant. And now I can use that, too. (8) Don’t forget to tip. If your child was especially trying or occupied a lot of attention, tip the instructor. And always tip for a private lesson. (9) Do consider a helmet. To learn more, go to lidsonkids.org. (10) Do stoop to bribery. When our son shows signs of weariness – or stubbornness – on the slopes, we entice him to take another run or keep trying with Annie’s Gummy Bunnies. Both my husband and I are armed with a pouch or two. So far, we’re lucky in that it only takes one or two bunnies to keep him going. Hopefully he won’t up the ante anytime soon. You are an awesome writer, I was thoroughly entertained and am eager for your next story- love the bi-polar like analogy- so true in this house! Very creative blog title as well, impressive! Love this!! All of it…the blog title, the idea of it, theme, etc. I think you’ve found a niche! Way to go Joan! Great blog – will pass it on to all the mom’s I know! This entry was posted on October 11, 2012 by mittenkidz in Winter Fun and tagged Crystal Mountain, Getting kids into skiing, kids ski lessons, Michigan, Ski, ski lessons for kids, Ski resort, skiing in Michigan, teaching kids to ski.